Why you Should Install One Under sink Water Purifier ? Under sink water filter has plenty of advantages over other types of water filtration system. This is the main reason why investing on it is beneficial. Note that water of questionable quality needs to be filtered to protect you and everyone in your home. Fortunately, you can do so with the aid of under sink water filter. It prevents you from spending too much on expensive bottled water while also adding convenience since you get easy access to pure, healthy and clean water. With an under-sink water filter, you don?t have to worry about ruining the space and cleanliness of your kitchen. Note that it only needs a faucet installed at your sink. It is different from regular filters in the sense that it does not come with any valves and tubes that clutter the counter. Aside from that, it is also aesthetically pleasing considering the fact that you can get a nickel or brass faucet, which can perfectly match your kitchen d?cor. It also remains out of sight. This gives you the chance to buy and install large models with fluoride, arsenic and nitrate purifying capacity. The only problem is that it often takes a while to install under-sink water filters, but you can speed things up with the help of a professional installer. If you?re still unsure whether the water supplied into your tap contain harmful contaminants with serious health threats, then deciding to buy an under-sink water filter can help. Note that even if you don’t use the tap water in your household for drinking, it can still pose a threat to your health if you use it in making meals, cleaning and washing. This makes it wiser to invest and install the under-sink water filter, which is guaranteed to offer pure and clean water. The good thing about under-sink water filters is that they can treat drinking water in the supply line prior to letting it reach the filter. Once it reaches the filter, the filtration system works by getting rid of sediments and other pollutants, making water safe for consumption and use in other household chores. Cartridges in these filters can also extract bacteria, particulates and viruses, making water even safer. With all these benefits, it just makes sense to contact an under-sink water filter service provider now and have one installed in your home. If you like to have a clutter-free kitchen, office pantry or work area, then choose our under-sink filters. Once installed, you can even forget that they are being installed there with only a faucet to supply clean water for all your daily activity needs. These filters do not take up sink or counter top space. Installation of an under sink filter usually needs a well-trained technician to help with the whole installation. They require space under your sink and a hole to be drilled on the sink or countertop if you do not already have a secondary faucet. 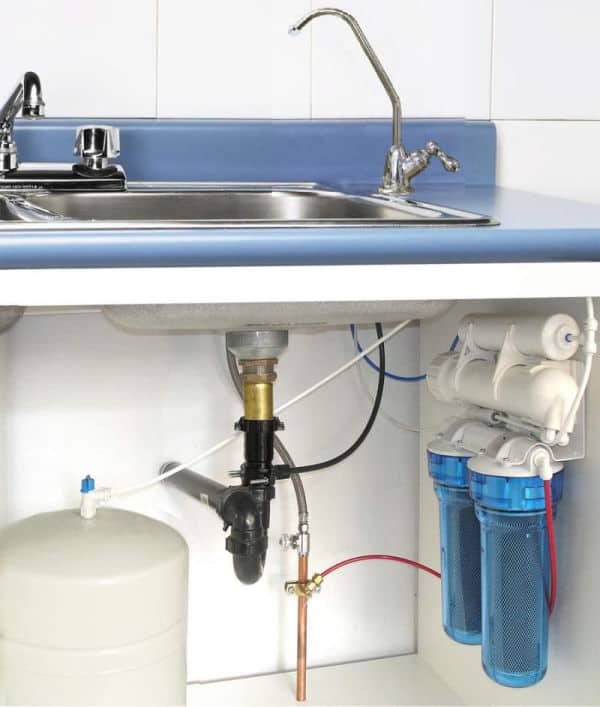 Need an under sink water purifier system now ? No worry, call our under sink water filter singapore representative now to onsite appointment.